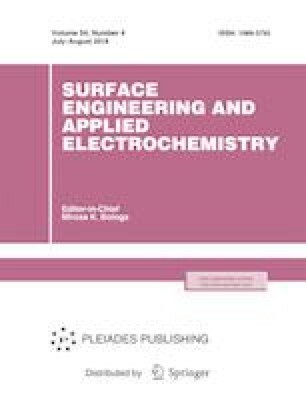 The influence of nickel sulfate additives to acid and basic electrolytes for microarc oxidation on the structure, composition, and properties of coatings formed on VT1-0 titanium were studied to produce poorly soluble titanium anodes. We established the possibility of incorporating nickel (nickel oxide) into the composition of coatings. X-ray diffraction analysis showed that the coatings contained nickel oxide β-NiO with a cubic lattice, TiO2 in the form of rutile, and SiO2 in the form of high-temperature β-cristobalite. The maximum thickness and nickel content in the surface layer and the minimum values of both the anodic dissolution currents and the electrical strength were obtained for the coatings formed in silicate-alkali (3 g/L KOH + 4.5 g/L Na2SiO3) electrolyte with the addition of 1 g/L of nickel sulfate NiSO4. Original Russian Text © N.L. Bogdashkina, M.V. Gerasimov, R.Kh. Zalavutdinov, I.V. Kasatkina, B.L. Krit, V.B. Lyudin, I.D. Fedichkin, A.I. Shcherbakov, A.V. Apelfeld, 2018, published in Elektronnaya Obrabotka Materialov, 2017, No. 5, pp. 8–14.